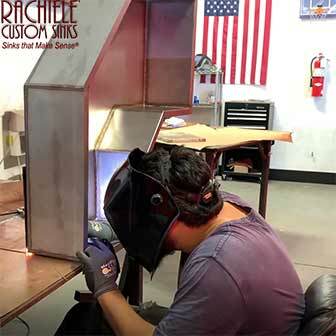 We are a small family owned luxury quality Custom Stainless Steel and Copper Sink Manufacturing business located in Central Florida since late 1998. Metal sourced domestically and everything is manufactured here in my factory. We sell direct to the end user at factory direct pricing. Click here to read over 115 Five Star testimonials on Xuzhou. Want a laugh? Click here. When you see this anywhere on our site, you can hover over it for more in-depth or important information. Check out our specials/clearance page. When considering a high quality copper or stainless sink ALWAYS ask for the official metal certification in writing. If a claim is made that the metal is domestic, the certification will show where the copper was melted, manufactured and the purity. Feel free to email me for a copy of our latest copper or stainless certifications. If an import company makes purity claims, have them email you independent current test results. Save time, no more mess on the counters. Enjoy the future of sink design now. I have redefined what a kitchen sink does. Basically, it now does "everything". Your counter tops have become almost obsolete. Don't put an obsolete sink in your new kitchen. Look what you can have under your Rachele Sink. Watch the video below to see why my NexGen sink is the sink that can do it all! Custom Fitted Residential Kitchen Sink Design: my passion for over 20 years. Hello, this is Dino Rachiele. 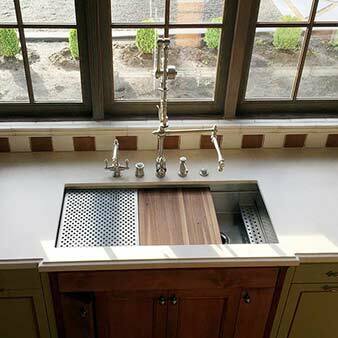 Every aspect of my custom fitted sink designs is based on my previous 22 year career (1977-1998) as a professional kitchen designer (specializing in ergonomics) - designing thousands of custom kitchen projects, as well as installing a few myself. The rest of the sink industry knows how to build a sink well. They just don't have the unique background to know why to build one that is efficient, ergonomically correct, etc. Almost all of my sinks are custom designed and tailored to the user(s). "One design does not fit all". Sinks are like clothing. 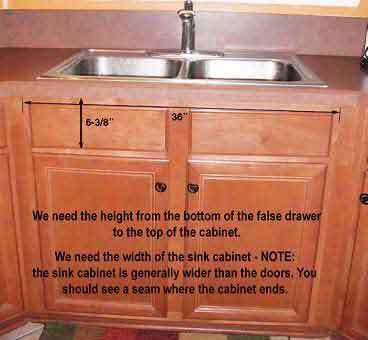 Sinks should be fitted based on the user(s) height, handedness and many other factors. A properly fitted sink will be much more comfortable to use than a generic sink. I have thousands of emails expressing that fact from past clients. Designing custom sinks is my passion for being in business. I love what I do and take a great deal of enjoyment knowing that I have significantly and positively impacted the daily lives of thousands of families. In order for me to design your sink, I must get to know you a bit and I ask many questions that impact location of drain, depth of bowl, height of ledge system and more. My goal is to save my clients hundreds of hours a year and make kitchen tasks not only easy and efficient, but enjoyable. Based on almost daily positive email feedback from past clients, I believe that I have been successful in this endeavor. This joy is what makes it easy to come in the office 6-7 days a week for 8-12 hour days. My philosophy as taught by my father: "Do it right the first time, do it with the best materials and labor force and offer unparalleled customer service at a fair price. Those ideals will build an enviable reputation." He tells me: "Those who sell similar products for less, are offering less. Don't worry about them. Their reputation will eventually expose the reason for the lower prices." "Pay and compliment your employees well, so they feel valued and they will do their best work." "Do your best to educate your customer so they are well informed and they will make a good decision." I am grateful to the wisdom of my, now almost 97 year old, father. For these reasons and many more, we were able to stop advertising 12 years ago. We rely on referrals and repeat business for 80% of our new sales and we are always extremely busy. My father was right. We are in an enviable position. There are few national successful companies with an advertising budget of less than $50 a month. New for 2019 We believe this is the first14 gauge Solid American Cold Rolled Brass Workstation Farm Sink ever made! The skill level required to build a brass sink of this quality is extremely rare. Our team has that ability! 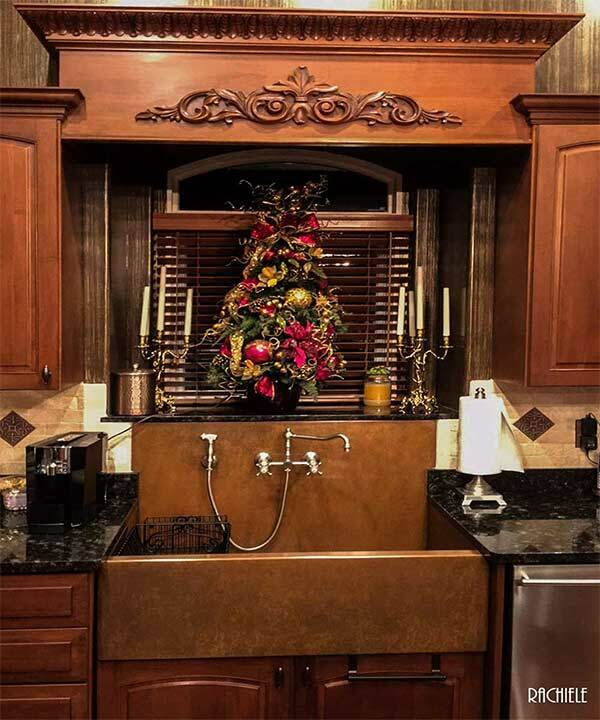 We are proud to introduce Custom Brass Sinks to our audience. The method for construction is unique and we make them right here in our factory in Apopka, FL. Specifications will be similar to our copper and stainless sinks. Pricing will be by phone request only. 407-880-6903 These sinks will be custom fitted to the user. No online sales for these beauties! I dare say the workmanship you see on this sink is second to none. We invite you to visit and inspect the high quality welding and finishing on these sinks. All Brass sinks will have a small radius corners - unique to our brass sinks. 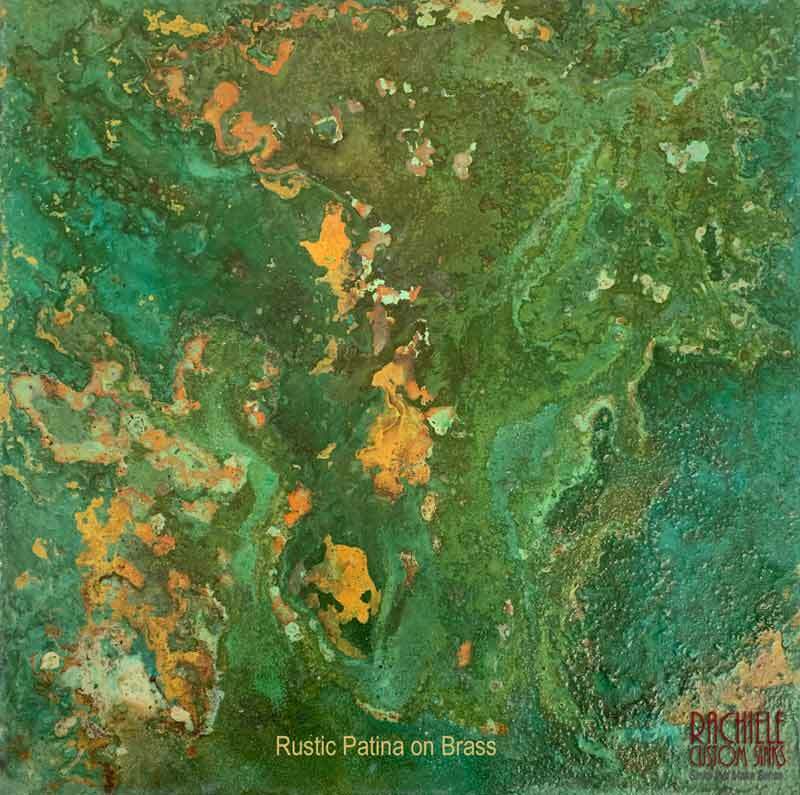 We will be offering similar Rustic Patinas to the copper Rustics you see. This sink is in a raw state. 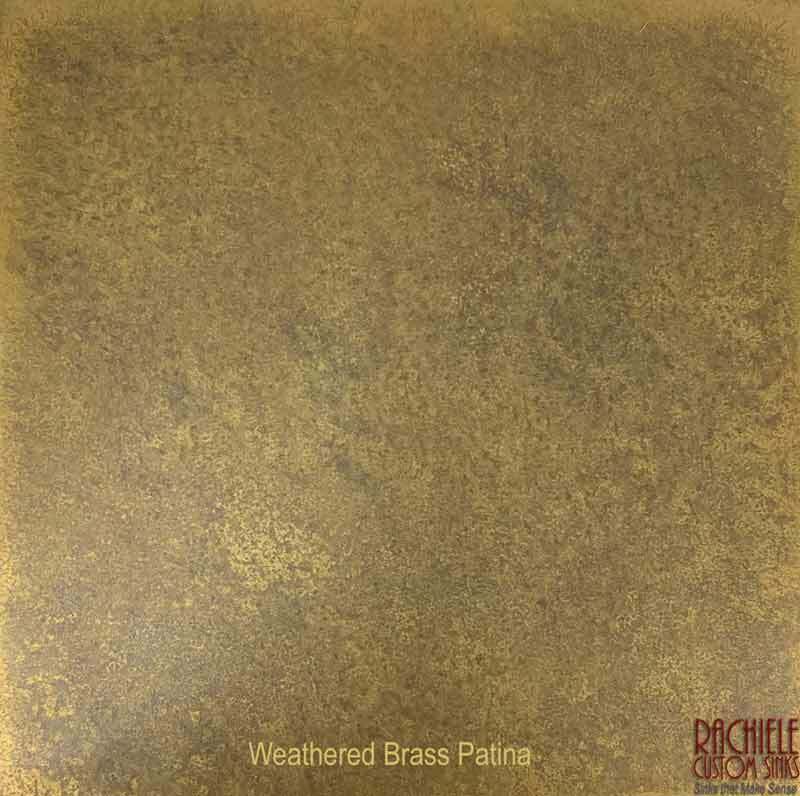 All Brass Sinks will have a weathered patina in the bowl and will offer a bright brass apron, a weathered apron or Rustic Apron (see just one option above. More designs and patina choice photos coming soon! NexGen - Arguably the Most Advanced Workstation Sink Design in the World! Available in Copper and Stainless. Leading the Sink Design Industry since 1999. You will work directly with me (Dino Rachele) throughout the entire project. Unlike the other brands, most of our sinks are all custom designed by me with you. You and I design the sink together to be fitted to the height, handedness and lifestyle of the user(s). This is a process that I truly enjoy and am passionate about. My 40 years as a professional kitchen designer, with studies in ergonomics, has given me unique insights into sink design. I have always thought outside the box (hence a raft of patents) and would love to share some of my thoughts and get yours as well. My sink designs are a collaborative effort between you and me. As a former professional kitchen designer and remodeling contractor, I remodeled thousands of kitchens going back as far as 1977 and have valuable experience that presents itself daily. Potential design and installation problems are foreseen and avoided. 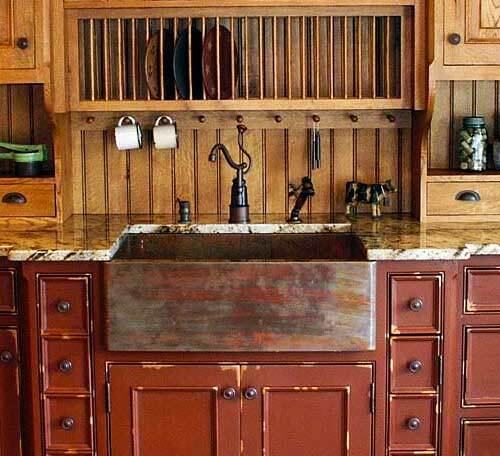 In my opinion, if you are going to sell custom sinks, you should have a thorough knowledge of the cabinet business, the counter-top business and the plumbing business. I have installed kitchens, counter-tops and sinks as a professional. I have saved countless clients from making huge and costly mistakes as well as offered valuable kitchen and bath design enhancement suggestions that have been used with a great deal of gratitude from my clients. If you are simply looking for a cheap sink or might consider second best, you may be in the wrong place. If you are looking for unparalleled value and a personal sink design that will significantly enhance your lifestyle - you are in the right place! Why don't we sell through dealers? The answer is simple. I tried that from 1999 through 2008. They were not able to keep up with my constant new innovative design ideas, finish ideas and improvements. Now, I offer my sinks to you factory-direct. Speaking of innovations, read on below to see our new NexGen sink design. This design is a game-changer! All too often we cling to technology of the past because we are content with it. If we have never experienced the new technology, we may not know what we are missing. 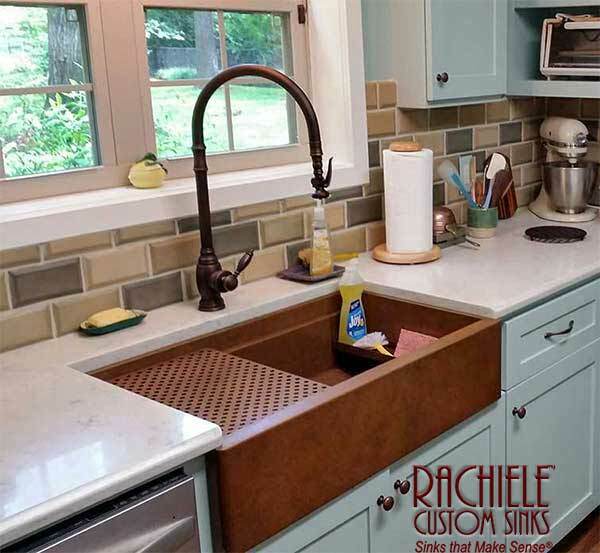 If you have never used a Rachiele Workstation sink, you may be clinging to old technology. Take the next step in kitchen sink design... Don't regret your choice down the road. While others merely sell sinks, we improve lifestyles! 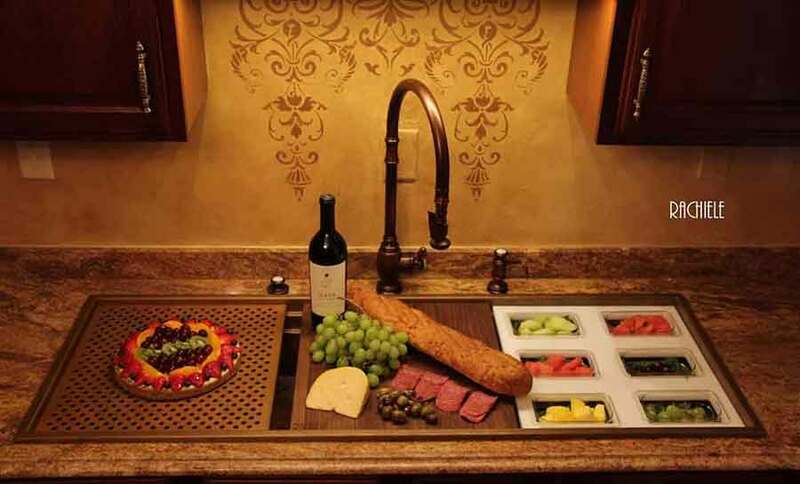 My Innovative Workstation Sink Designs translate to measurable time savings and enjoyment. Your life is about to become easier...hundreds of testimonials attest to the life changing benefits of my sink designs. My custom workstation sink designs are over 95% of our orders. My design eliminates the need for expansive counter space. If you are constantly looking for "Restaurants Near Me" on your cell phone, my sinks might just make cooking at home more enjoyable. We build in Type 316 Marine/Medical Grade Stainless - nothing but the best! 4. look for a company with a long history of of independent testimonials and plenty of installed photos (not just a select few). 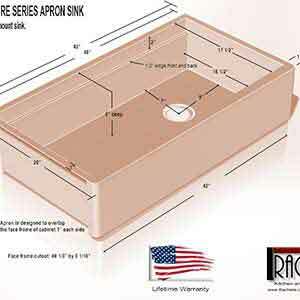 Why will your hand-made in the USA copper sink be less expensive than the imports in the long run? You won't ever have to replace it! 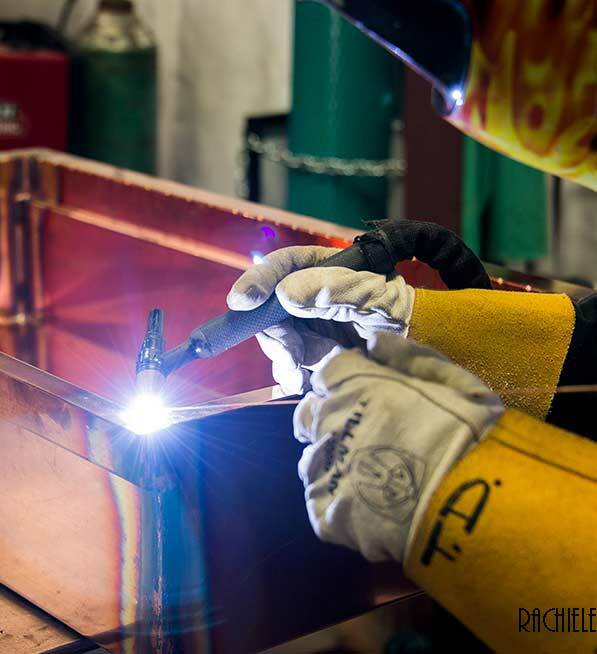 Your hand-crafted kitchen, bar or bath sink will be made with a superior grade and type of Domestic Copper and handcrafted by our highly skilled metal workers with 100 years of combined experience. No other company (to my knowledge) uses 14 gauge COLD ROLLED virgin domestic copper, which is 8 times harder than annealed recycled copper - like the imports use. Sadly, I have replaced dozens of imported copper sinks that have failed. Some had leaked, some had finish issues, some did not drain properly. 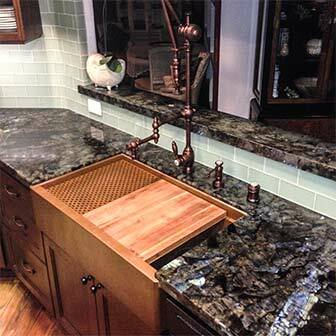 I offer a lifetime "Transferable" warranty on your hand-crafted sink whether it is copper or stainless. 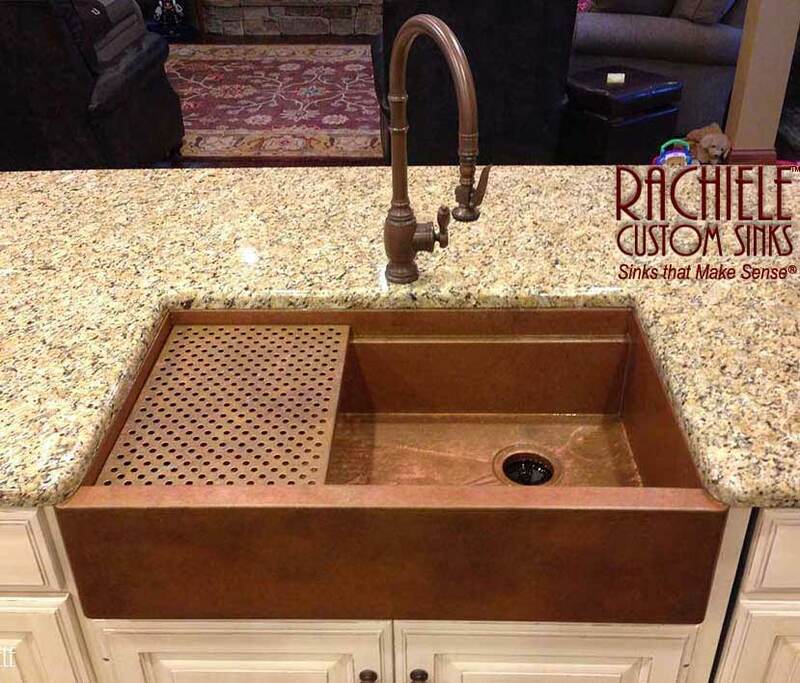 Your Rachiele copper sink does not need to be dried after each use. 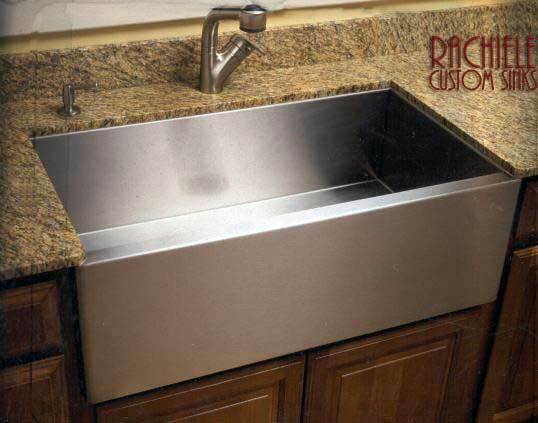 Your Rachiele kitchen sink is designed to drain properly. Your sink will be exactly the size you order (our tolerance is 1/32") as compared to plus or minus 1/2" as all of the imports indicate. Your new copper sink will have a self healing patina unlike the unnatural finishes used on virtually all imports. No waxing needed. Extremely low maintenance - treat my copper sink like a sink, not like a piece of furniture. For the most part, 95% of all copper sinks you will see are imports, and are sold through companies with no ownership in the manufacturing process. You are buying from a "middleman". Their quality control is long distance. Take a look at the second video. I dare say there is no other company that can produce a patina like this. I own my copper and stainless steel sink factory and it is 3 miles from my home. We manufacture under my daily supervision using very sophisticated equipment and extremely talented metal workers. Nothing leaves here without passing my strict quality standards. No middleman here! And, by the way, when was the last time you heard of a company with an advertising budget of $50 a month? That is our budget. We have not needed to advertise since 2008. The bulk of our business is referral and repeat business. Save space, save money, be comfortable, fully enjoy your kitchen for the first time! 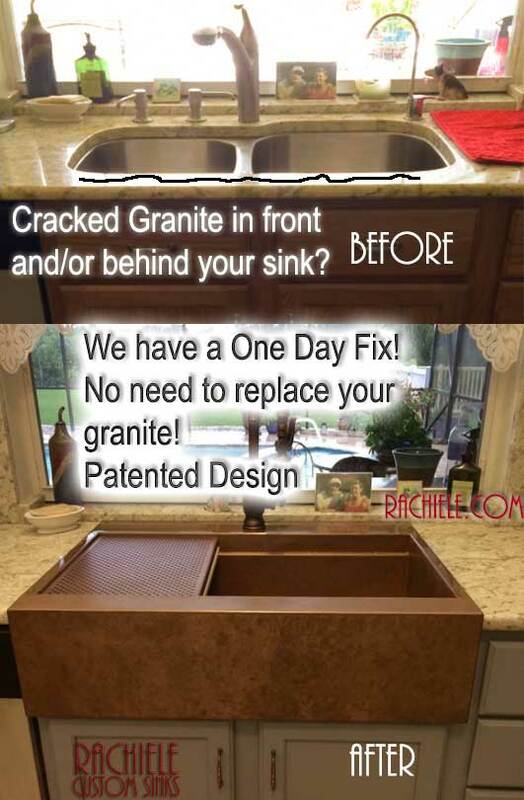 Sadly, cracked granite around a kitchen sink has become an epidemic. I have a patented one day fix. It is a sad testimonial that the copper sink business is reminiscent of the 1960's used car business. There is so much false or intentionally omitted information out there that it makes my head spin. 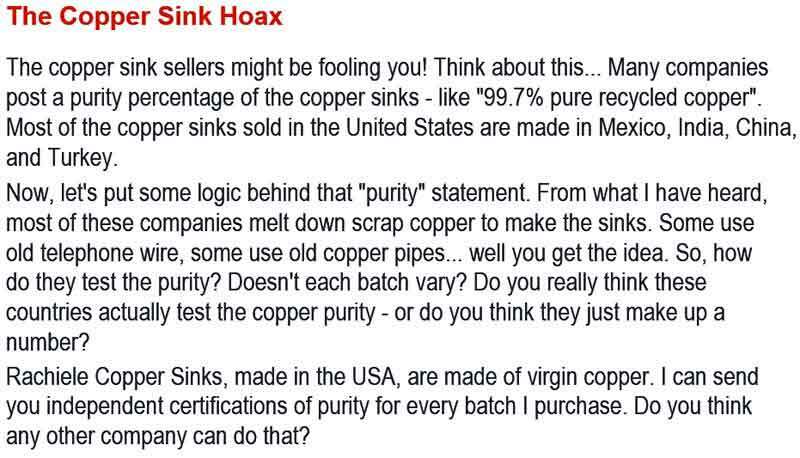 Many copper sink companies intentionally do not tell you where their copper sinks are made and do everything possible to give the "illusion" their sinks are made in the USA. The first thing you should do is call and make sure the sink is really made in the USA. Also, ask where the copper comes from. One such company claims their copper sinks are made of 14 gauge cold rolled copper. Our customer was given the impression their sinks were made in the USA. It turns out all of their sinks are made in China! Another company claims to be made in the USA but after some investigating you will find their copper is imported. Trust your instincts. As they say... Trust, then Verify. Make sure the information is in writing either on the website - next to the sink you select or indicated on every page of the site. 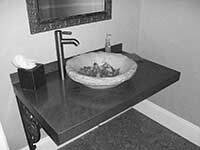 Another USA manufacturer mixes locally made and imported sinks on their website - very confusing. Yet another site has such microscopically small photos that you cannot see the defects in the construction. My contention is this: If you are not proud of what you sell, why the heck do you sell it? This is the ultimate misdirection found on a website: "All of our copper is domestic grade, meaning it comes directly from a supplier here in the United States of America." I am willing to bet that the copper comes from outside the US. If you see that comment, ask where the copper is actually made. Get written proof. If the copper sink retailers are proud of what they sell, proudly say the sink is made in Mexico, China, India, Turkey or wherever! Most importantly, ask for references that have had their copper sinks installed for over a year. Talk to them on the phone! This is another way to see how long a company has been around and whether or not they hide their registration information. Type their domain name (www.rachiele.com) at www.whois.com. If you insert our domain, you will see we have been online since 10-25-1998, I believe we were the first copper and stainless sink company online - by several years. You may see coppersinks.com as registered on 11-20-1999. I purchased that domain on that date. I sold it to the current owner on 5-4-2012 for quite a high dollar. This is my site wide statement. Every copper and stainless sink we offer on our site is made in Apopka, FL using domestic virgin domestic copper and domestic stainless steel. 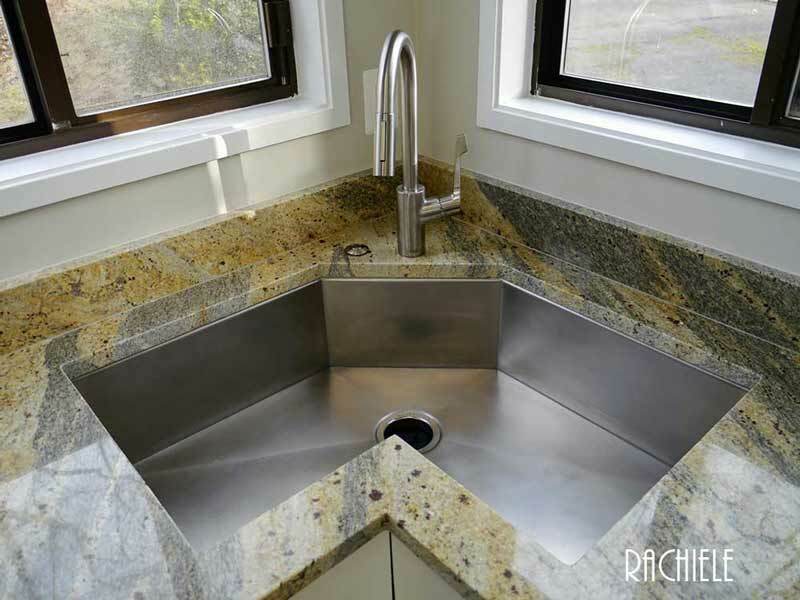 What makes a Rachiele Custom Kitchen sink so different from all others? Watch the videos below. 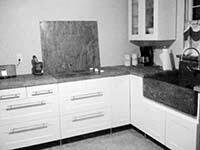 Backing into the sink design business as a 20-year veteran kitchen designer in 1998 gave me a unique perspective. I saw design and ergonomic improvements the "big guys" did not see. I was awarded 10 patents along with many "firsts" in the industry which many of my friends in the industry emulated in one form or another. This is a partial list. 1. The first to offer exclusively rear corner drains in single bowl sinks. 2. The first to offer a true workstation sink. 3. The first to design and patent a retrofit farm sink to fit in existing sinks. 4. The first to realize 8" deep sinks with rear corner drains was the ideal depth for most people. 5. The first single bowl corner sink. 6. The first single bowl corner workstation sink. 7. The first to offer a sponge caddy for convenient "in sink" storage. 8. The first Millennia textured stainless material 9. The first hand finished stainless allowing for easy care. 10. The first sink with two internal steps (Evolution) - granted three U.S. Patents. 11. The addition of a secondary removable bowl for our single bowl workstation sinks. 12. The first to offer a strainer to fit inside the bowl to soak vegetables, etc. 13. 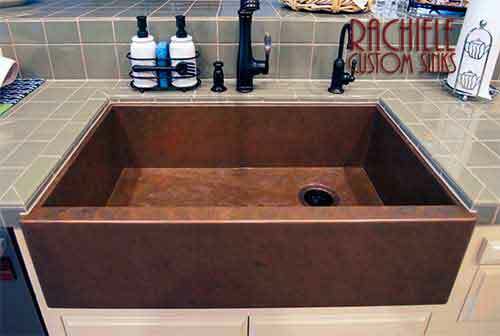 The first to offer Copper Sinks using pure domestic cold rolled copper. 13. The first to offer Brass custom sinks (again using domestic brass). 13. 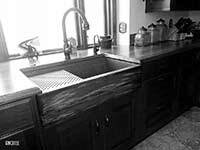 The first to offer 316custom sinks. 14. The first to offer Brass workstation sinks. 15. The first to ship USA made custom sinks worldwide in countries such as Israel, the U.K. China, Guam, Egypt, Australia, Singapore, and more. We are blessed to have had an 8 year stretch with a virtually zero budget for advertising. The bulk of our business now is referral and repeat business and the occasional family that finds us through the search engines. My mentors over the years taught me that if I never offered anything I would not consider the best I could offer, treat my customers the way I would like to be treated, and most importantly... love what I do, I would be successful. The thousands of referrals and repeat customers seem to substantiate their advice. I would like to single out one of many of those mentors: Ray Martino, of Modern Kitchens and Bath in Syracuse N.Y. He has now passed on, but his legacy and my thanks live on. My father taught me my family name, Rachiele, and the reputation that goes along with it is my most valuable possession. Always try to do the right thing, even when it hurts. Focus on the positive, see the best, not the worst in people and most importantly; family is always first. Imagine life before the smart phone. Imagine life before the television. If you are considering a double bowl sink, you are going back in time! The double bowl sink and sinks with center or rear center drains were designed generations ago and they never evolved. If your cookie sheets, pots, pans and platters do not fit completely in your kitchen sink... your kitchen sink is obsolete! If you are preparing your vegetables, meats and poultry on a cutting board adjacent to your kitchen sink, your kitchen sink is obsolete. A simple drain location change, (rear corner) combined with a single bow sink design, fixes the issue with large pots, pans, platters and trays and allows you to use my kitchen sink like a double bowl kitchen sink. Wash on the right, set off on the left. My kitchen sink design has a generous slope to the drain. 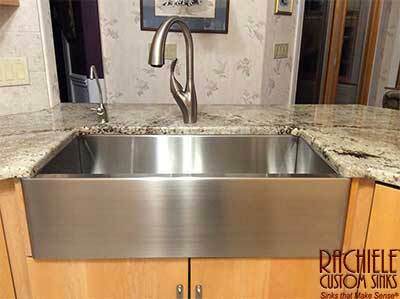 A Rachiele single bowl kitchen sink with a rear corner drain allows you to place large items (cookie sheets, platters, refrigerator shelves and more) flat down in the sink for washing and rinsing without covering the drain. None of those items will fit in a double bowl sink! Also, there is no logical reason to have a drain in the center or rear center of a kitchen sink - yet 95% of all kitchen sink manufacturers still cling to that obsolete kitchen sink design. Our Signature Series and NexGen Workstation Kitchen Sinks are the "Smart Sinks" of the 21st Century. Small interior steps or ledges allow for a metal multi purpose grid to sit below the top of the sink adjacent to a cutting board. All food preparation is now done on top of the kitchen sink. Place items on the grid to rinse, move one at a time to the cutting board to prepare, then sweep into a bowl waiting in the sink. 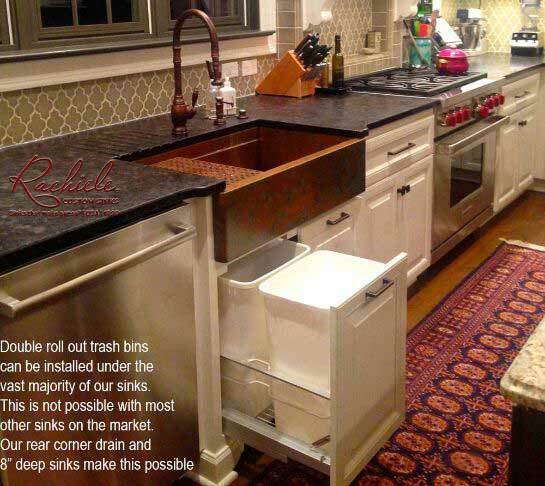 Imagine this... no more wiping down counter tops! All of your food preparation is done on the sink. Food preparation becomes something to look forward to. With my kitchen sink design, food prep activity has evolved from a chore to a pleasure. Clean up is just as amazing. Wash on the right, set off on the grid (the multi purpose grid also fits on the bottom) to dry. 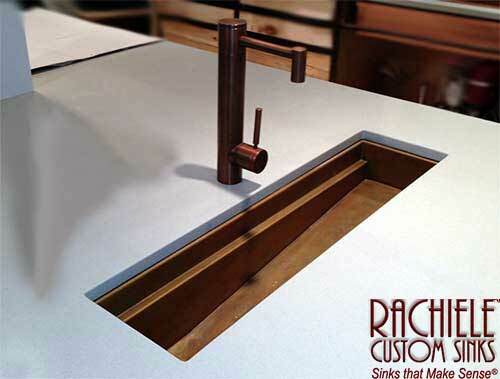 "Your life is about to get a little bit easier"
10,500+ happy customers love their Rachiele Custom Sink. The majority of our business is driven by referrals and repeat business. 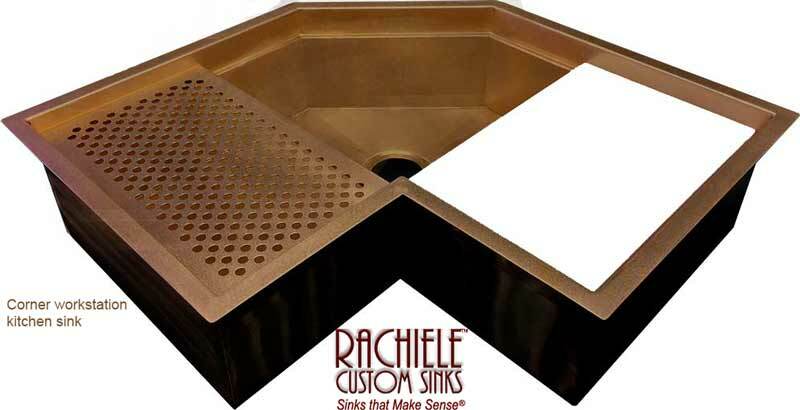 Rachiele is the original family owned custom copper and stainless sink (and now brass) company - leading the industry for over two decades! 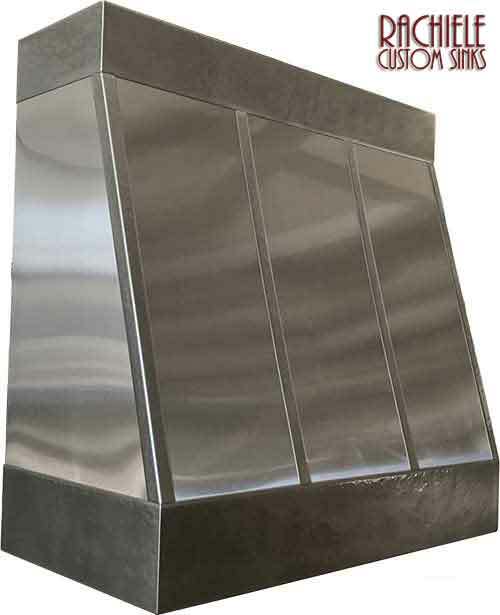 If you are looking for a custom copper sink, custom stainless steel sink, custom copper hood, custom stainless steel counter top, custom copper counter top, you have found the manufacturer who sells direct to the public and we focus on quality, not quantity. While most kitchen sink, bar and bath sink companies build more sinks in a week than we do in a year, our quality and customer service leads the industry. Other custom shops specialize in duct work and ornamental metal work. 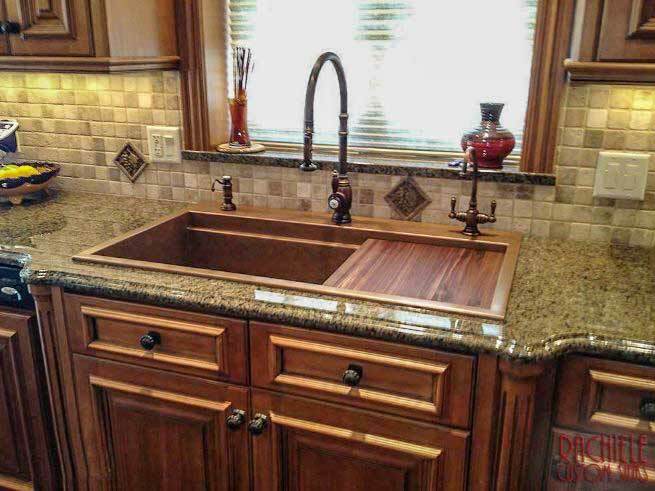 We specialize in custom sinks! You are not just a number or quota, you become a respected friend and part of our family. 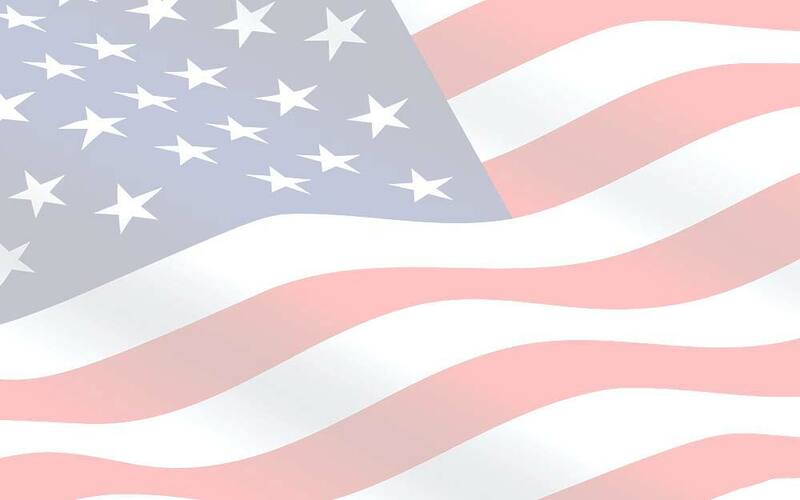 All are manufactured in the USA in my factory in Apopka, Florida. Everything is offered direct to the public at factory direct pricing. If you are interested in faucets, hand painted lavatory sinks, visit our sister company, TheUSAHome.com, for great prices and free shipping. Everything on that site is made in the USA. The photographs do not do my sinks justice. Even when we send a photo of a sink just prior to shipping, our customers regularly tell us that their kitchen sink looks significantly better than they expected. This is a recent quote from a customer who just received their sink: "You're right. Way more stunning when you're there looking at the real thing." You should expect to be wowed! 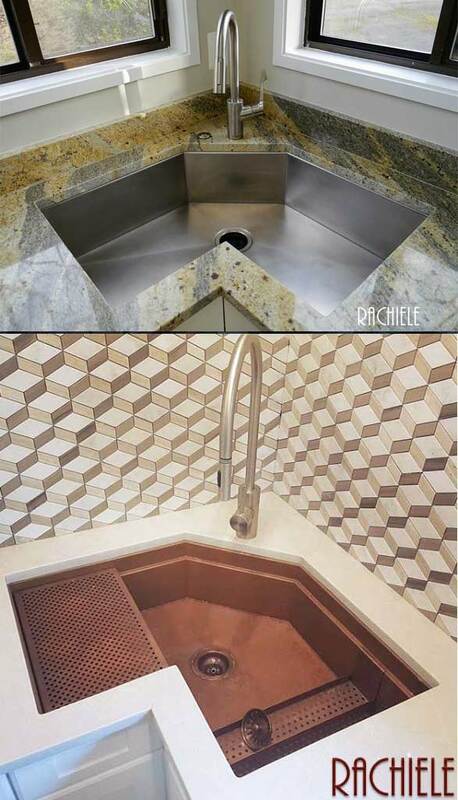 A Rachiele Custom Sink is a statement of quality and is unmistakably unique. 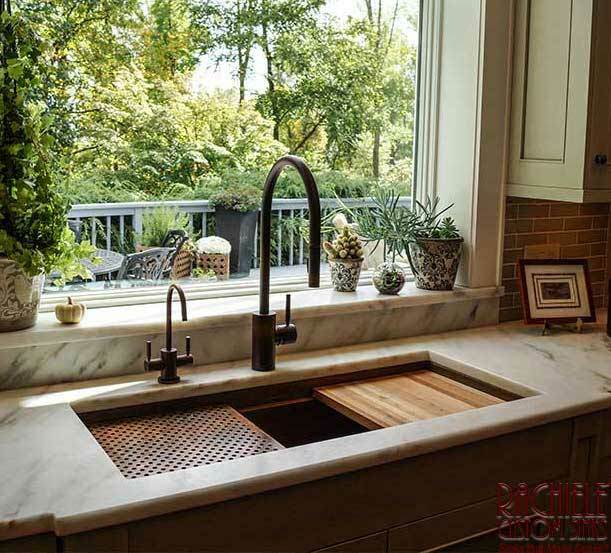 If you are looking for a corner sink, a copper farm sink, a copper tub, a copper bar sink or a copper or stainless steel counter top - you are in the right place. If you are looking for the most unique and finest quality stainless steel sinks on the market, you are in the right place. 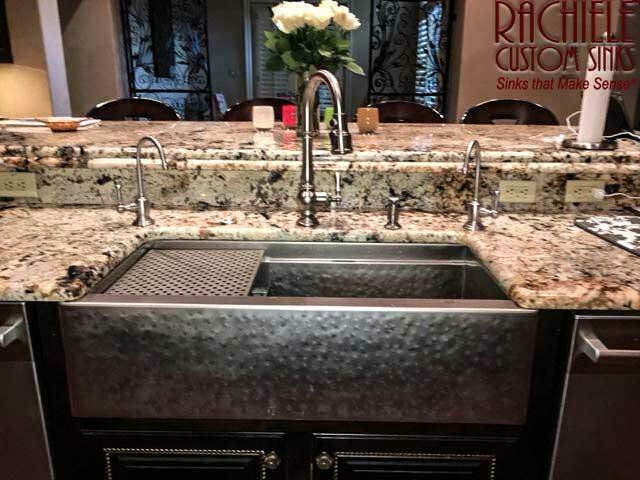 If you are in need of replacing your kitchen sink, and have had difficulty in finding a replacement, replacement sinks happen to be our specialty. We replace existing and discontinued sinks on a daily basis. If you have a crack in the granite in front of your sink, I have a great solution that does not require replacing the granite. If you are not thrilled with the quality of my sink, I will refund all of your money, pay all shipping costs AND send you a check for $100 in consideration of your inconvenience! That is how certain I am that I build the finest copper sink in the world. 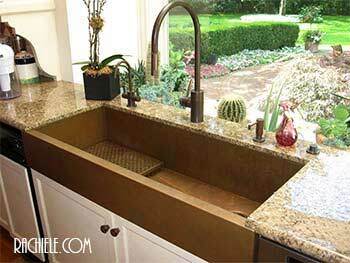 Copper sinks and ergonomics are my passion and my copper sinks are maintenance free. 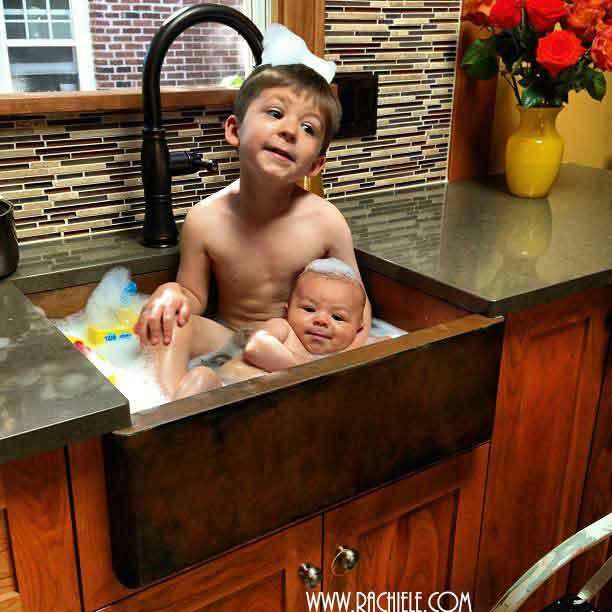 A kitchen sink is a permanent fixture. I do not settle for second best and I don't expect you to either. We ship internationally on a regular basis. We have even shipped sinks to Australia! Our international shipping rates are quite reasonable. Whether you live in Canada or Guam, Australia or the United Kingdom - I can ship you a custom sink. 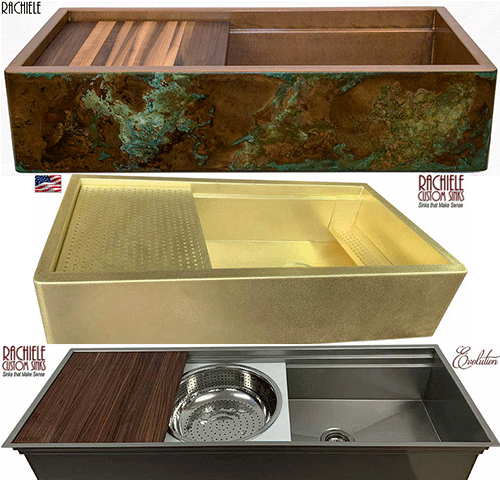 Your Rachiele copper sink will be distinctly unique! 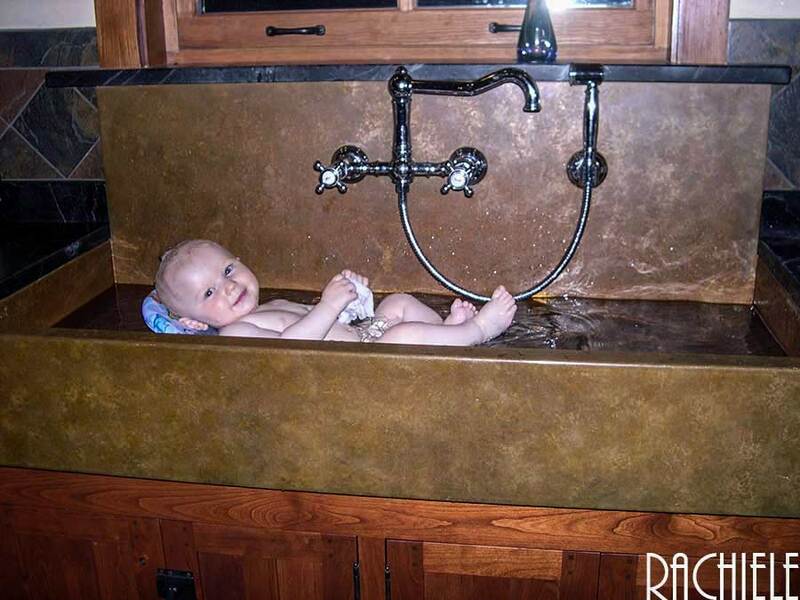 If you are looking for a copper sink, please look through our copper sink comparison page. A Copper Sink is different from company to company. 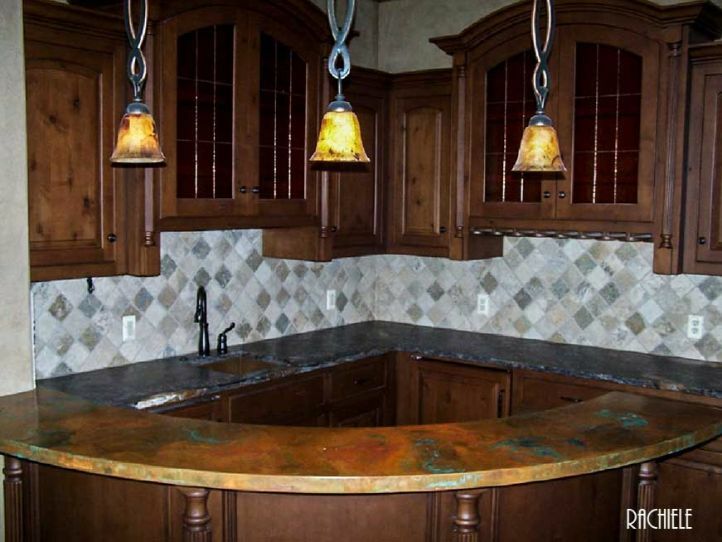 Your copper sink will be custom made to fit your needs and we generally build a sink in just 1 to 3 weeks. We can even overnight your sink for an additional fee. quite this much for a kitchen sink it was well worth it." Karen and Robin Shop Now!